The Trifids, M20. LRGB Lum 7x10m bin 1x1, RGB each 12x5m bin 2x2. Taken with TEC 140 @f5.6 and FLI ML8300 camera at -30C. Shot July 05,09,10, 2012 by Lynn Hilborn, WhistleStop Obs,Grafton, Ontario. 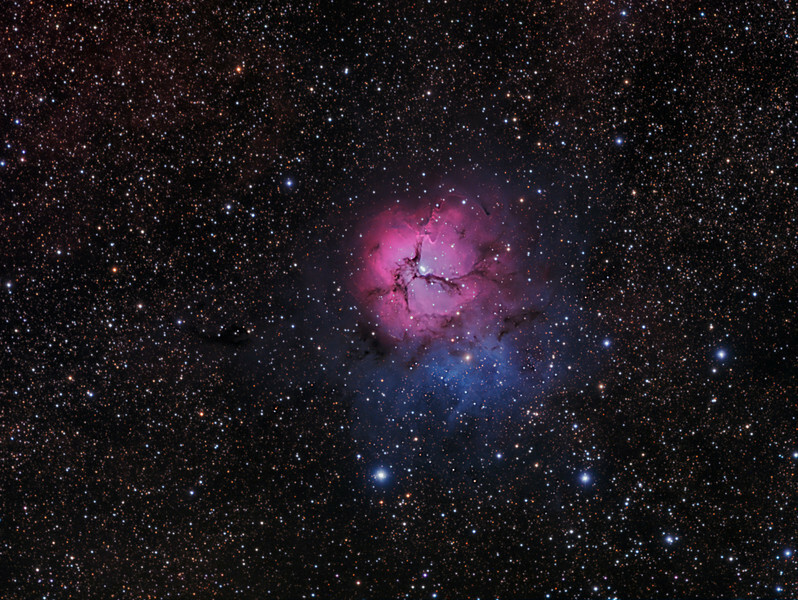 A gem of the summer sky, M20 allows us a view into the exciting science of star birth. M20 is a young HII region (300,000 years old) about 30 light years across and is illuminated by the O-type supergiant HD 164492 at the center of its trilobed emission cloud. The ionizing star is about 30 times the mass of our sun and is the "A" component of a triple system ( A, B, and C components). In all there are seven members (HD 164492 A through G) of the small cluster packed within a half light year at the center of M20. As an HII region M20 is similar to M42 in its complexity and relationship to its parent molecular cloud but is much younger. A large blue reflection cloud forms the northern border of M20 and is illuminated solely by the F-type supergiant HD 164514. Recent X-ray and infrared observations have discovered an amazing array of very early stars and protostars within M20 giving us a rare glimpse of the earliest stages of star birth. Stars in the earliest formative stages are difficult to detect optically as they are shrouded from view by their parent molecular cloud. They reveal their presence by jets and outflows of gas which characterize their unstable and turbulent beginnings. The power of infrared observations (Spitzer Observatory) allows astronomers to "see" beyond the cloak of gas and dust that obscures young stars. Large populations of the earliest protostars or pre- main sequence stars (Class O and I) have been detected along the filamentary dark lanes near the reflection component. More evolved protostars (Class II) are found along ionization fronts within the rounded brighter parts of the emission cloud. Text with thanks to Robert Gendler.